I have been looking forward to reading this new book by Lisa Moore. I read February after it won the Canada Reads 2013 and loved it. I knew that Caught was going to be different, but for some reason I was expecting more of a fast-paced adventure. And it wasn’t, really. It was definitely more plot-driven than February, but it still had Lisa Moore’s spellbinding writing that is too trance-inducing for a fast-paced novel. The book starts out with the main Character, Slaney, breaking out of prison after 4 years of incarceration for smuggling marijuana into Canada. Moore describes how someone might feel after getting out of prison for the first time in four years. The rest of the story tells of Slaney’s journey to reunite with his friend, and his second attempt at smuggling. I really liked Slaney’s character, but I couldn’t understand why he was so determined to make the same mistake twice. What was it that kept him going? I worried about him through the whole book. I didn’t want him to get caught. 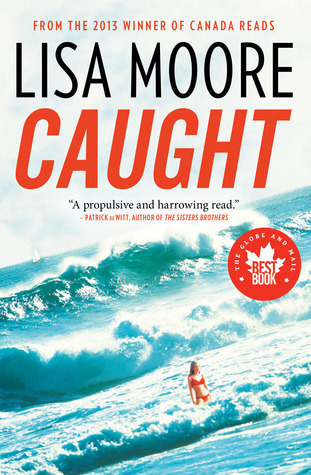 Caught was a great book, but it won’t stick with me like February did. Still, you won’t be disappointed. This book has something for everyone. It has adventure, great characters, thought-provoking sub-themes, and beautiful writing. Reading it is entertaining and effortless. Sometime soon I would like to read her first book, Alligator, so I can compare the three. I had never read Moore before Canada Reads last year.Now I can’t wait to read this one. I think it will take a while to make its way over to the UK, but it’s on my list! Did you read February then? I was surprised by how much I loved it! I still haven’t read her first book, Alligator. Looks like a book I’ll also enjoy reading! Thanks. This was a good one, too- enjoy!